Have you ever had one of those months (or years)? One of those times when life happens so much that homeschooling doesn’t? What do you do when life gets so busy or crazy or complicated that you have a hard time holding homeschooling together? In November we had the opportunity to visit some family for Thanksgiving. So we loaded up the car, left both house and homeschool in a mess, and took a road trip from the middle of Texas to the middle of New Mexico. While we were there, I did some thinking. On our first night at the hotel in Roswell, we caught the second half of a movie we hadn’t seen before — Meet the Robinsons. If you’ve seen it you know that the motto “keep moving forward” is presented repeatedly throughout the cute and meaningful movie. It wasn’t lost on me that this little piece of advice was precisely what I needed to hear. This is what we had been doing, but I was lamenting neglecting history, science and geography for the past two months. There is no going back; there is only forward. I can’t go back and get all the lessons and projects done. I can look ahead and plan for the future and keep moving forward. We haven’t completely stopped homeschooling all together. We have just been doing the bare minimum for a while. The first thing you can do when you see that homeschooling is going to suffer through a particular season of life is to simplify. Two months ago when our church split and my husband became our interim pastor, when I took on many administrative duties and other responsibilities that were going to take a while to get used to, the first thing I did was clear our schedule. I culled other responsibilities and activities that happened during our weekdays, and I cut back on our school day as well. Simplifying gave us a little more time to do less school work. While not lowering my standards (I still expect my children to do their best, to understand and learn the math, and to progress in their reading and spelling, etc. ), I did lower my expectations a little bit. In Texas, we don’t have a required number of hours or days for school, but in my head I have my own requirements, and I needed to adjust them. Instead of expecting to get a full course load done each day, schooling on time, every day, we scaled back to basics (math, language arts, and civics), getting it done when we could, on most days. If you live in a state which requires a certain number of hours and days, you may have to adjust your schedule differently than I did, but you can still find a point to scale back to. Perhaps a larger part of your day can be independent study, watching documentaries, or listening to audio books. Perhaps you can take more days off now and extend the end of your school year out further into the summer. Changing your expectations for homeschool lowers the expectations you place on yourself and relieves some of the burden and stress you place on yourself as you work through the difficult season life has brought you. Even while cutting back a little, we didn’t forsake learning. There have been documentaries, reading, educational youTube videos, and the continuation of curiosity to always move us forward. By continuing to restrict electronics and other pursuit of entertainment during what would be school hours, and by encouraging the kids to read or follow up on interests and questions, the pursuit of knowledge still continues. Though we may have spent less time in the books, we have also spent a lot of time lately serving others, and there are things to be learned there as well. The kids have helped with church events and projects and helped around the house more — also worthwhile investments. All of life is an opportunity to learn. 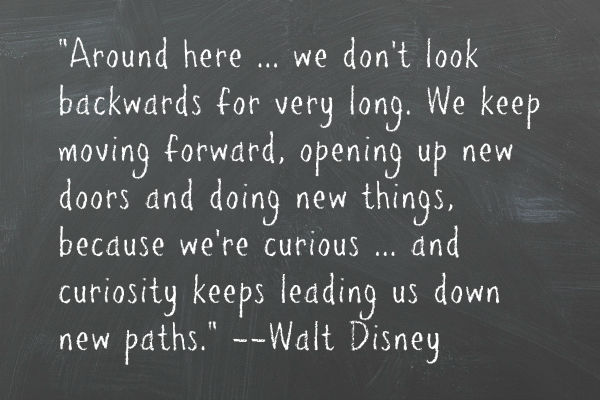 The motto from Meet The Robinsons, “Keep moving forward,” is actually taken from a Walt Disney quote. Couldn’t he have said the same thing about homeschooling? At the end of our trip to Roswell, we drove down to Carlsbad Caverns to explore the caves. After about a mile and a half of steep hills, inclines, twists, and turns, my nine year old son was weary and wanted to go back. “We can’t go back,” I told him, “We have to keep moving forward.” At one point I carried him on my back for a while, the elevator at the end drawing us forward step by step. This is how homeschooling works. Some of the inclines are steep. Often it is beautiful and wonderful. Sometimes we feel like we need to be carried. But we can’t go back. We move forward step by step. One day at a time, one week at a time, we move forward and we do our best. I miss the rest of our school. I miss the science and The Mystery of History; I am ready to get back to the worldview and North Star Geography. As long as we keep opening new doors and keep letting curiosity lead us down new paths, I think we’re doing something right. 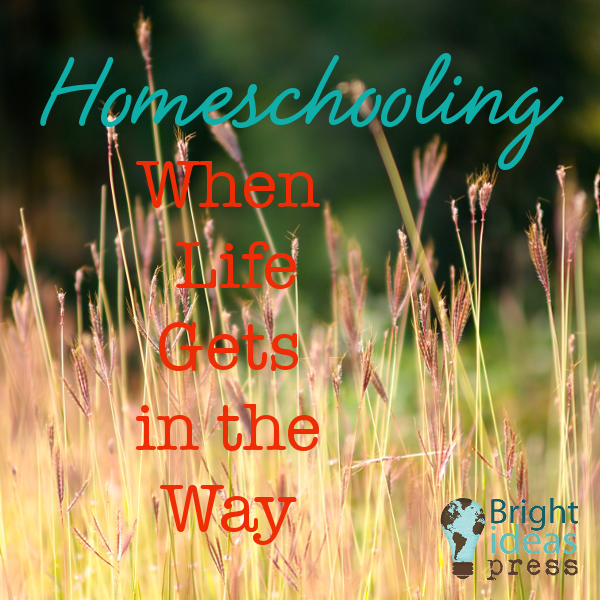 What do you do when life makes it hard to keep homeschooling the way you want? You keep moving forward, homeschool mom. Take a look back, make some notes, and keep moving forward. I find this to be very true. When we have a busy season or sometimes just a week. I try to make sure we get Language Arts and Math into our homeschool day. Some times we take a day and skip those topics to work on History, Science, or Art. Each day when we need to cut back I try to make it interesting by doing at least three subjects and then allowing time for an individual to study something else on their own or play/ride bikes outsides, etc. Thank you for this. I have been beating myself up for a while now, for not adhering to a plan I created months back. We too, have just been doing the bare minimum. I too, live in Texas and know that a certain number of hours is not required; however, in my mind, it’s not that way. Thank you for freeing me, mentally.